Description This Savannah, Georgia hotel has an outdoor pool, free internet access, non-smoking guest rooms and an on-site restaurant. A cool modern lobby with media pods and a GoBoard a relaxing heated outdoor pool and sun deck a bistro that makes the meanest breakfast sandwich you've ever tasted: our guests loved the hip vibe of the Courtyard by Marriott Savannah Midtown. This non-smoking hotel has 144 rooms and suites on three floors. All rooms have 37-inch flat-panel TVs complimentary high-speed internet access free newspapers each morning crisp white linens and plenty of fluffy pillows. Some rooms have balconies overlooking the pool area. The lobby completed in 2010 features an interactive GoBoard with lots of features to show you how to get around the city. Circular media pods provide the perfect space to work wirelessly alone or with friends watch TV with your own personal remote or have an intimate meeting that keeps everyone in the loop. The Bistro provides fresh meals and beverages in a quick-serve caf+¬. You might start your day with Starbucks coffee and a wide selection of pastries an egg sandwich or a fruit and yogurt parfait. In the evening The Bistro offers fresh hot sandwiches entr+¬e salads and soups. Or relax with friends and enjoy a craft beer or a tall slender glass of chilled wine. The hotel also has a fitness center and free parking. 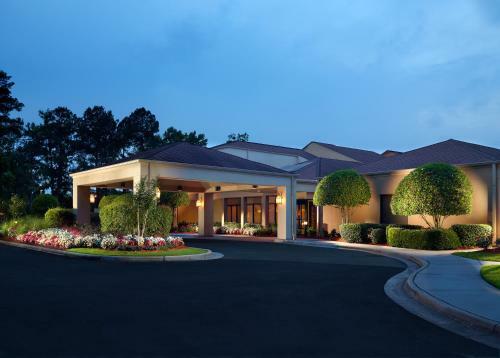 The Courtyard is a seven-minute drive from Savannah's Historic District 14 miles froandm Savannah/Hilton Head International Airport. The gorgeous beaches of Tybee Island are a 30-minute drive. Add Courtyard By Marriott Savannah Midtown to your free online travel itinerary.